Some people get a dopamine kick every time someone likes or shares their Facebook posts. Some get it from the number of ️hearts they get on their Instagram photos. And others – myself included – get a rush from Google Analytics. Yes, I like watching the number bouncing up and down on the real-time page. And the best part? Watching the traffic coming from Google > Organic. Because if Google thinks your content is worthy of a good position in the search engine ranking pages, then you must be doing something right, right? So what can you do to improve your SEO and get a nice boost in your organic search traffic? Read on for tried and tested techniques to help you pull you out of a traffic slump. OK, so writing original content isn’t exactly a ground-breaking technique, but what you want to do here is look at your content from a renewed perspective. Rather than focus solely on content for the sake of writing and having content on your website, you need to start thinking about your content from the perspective of the user who reads it. When writing content, you need to think along these lines: what is the user searching for when they enter this query in their favorite search engine? How can I write content that fully answers what they need to know? It’s Google’s mission to deliver to users the perfect search result, every single time. Google is the most popular search engine right now because it pulls off excellent searches over and over again and people have learned to trust the search results. Do you see a pattern emerging? 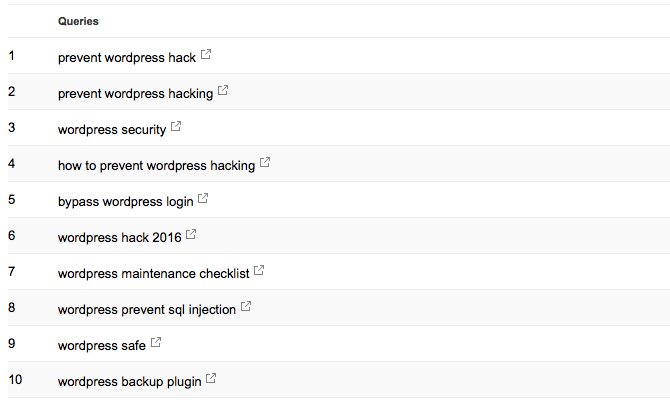 We’ve written an article about how to Prevent WordPress hacking, which is clearly the user intent behind that article. So we’re clearly spot on with the intent of this article. Yet, you can do this to reverse engineer the search intent. If you go to you Google Search console, click on the page that is ranking, and then click on “Queries,” you’ll actually see the queries your content is ranking for. Those queries may contain some great clues for a few things your content is not covering. You can then use that information to make that content more comprehensive and satisfy the search intent of more users. Google absolutely loves a refresh of old content. Actually, let me rephrase that: if you had content that used to rank but is now no longer relevant because it has grown old, you can easily have it rank it again by simply updating your content. It’s very simple to do: open the post you want to refresh, remove any content that is no longer relevant, and include new and updated content about that topic. The more content you write, and the more comprehensive you make your content, the better. Although the relevance of backlinks and their strength as a signal is waning in favor of user engagement signals, which I discussed above, good backlinks from authoritative websites in your niche can give your content a strong boost. However, with the advent of Penguin 4.0, which probably uses something called link distance to gauge the quality of backlinks, you need to spend more time and effort acquiring proper links. In a nutshell, link distance simply “ignores” links coming from sites that are too far out in a link-chain from authoritative, recognized sites. This really means one thing: the links you need have to be from quality, authoritative sites. And how do we get links from authoritative sites? Go back to step 1 – you need to have content that fully answers a specific question such that it can easily earn backlinks naturally. Of course, a good SEO will always be doing all the right things to nudge people to link to your content, and that, of course, is the real art of SEO – conducting subtle networking and outreach such that you earn excellent links to your content. OK, maybe this is not so simple. I get it. Yet, you really need to get working on this. No, it’s not about the traffic you get from the virality because there’s a side-effect to going viral – it will actually boost your organic rankings. Google has plenty of ways of figuring out what the best search results are for a particular query, but how does it know when a piece of content goes viral? The (theoretical) answer is pretty simple – and you’re probably using it right now to read this article: Google Chrome. Google Chrome is one of the largest sources of user data Google has (and providing the browser for free is not as altruistic as it might seem!). In the same way that Facebook uses your data to create an excellent profile for advertising, Google uses Chrome to understand what content is the best for its search engine. Hence the need for your content to go viral. A post that becomes popular and goes viral will send thousands upon thousands of positive signals about the content through Google Chrome, and Google will use that signal to boost the organic rankings of that post. Because if users are sharing that content out of their own free will, there must be something great about it – and Google loves great content. Topical relevance is something few people understand, but it’s one of the on-page ranking factors that can make a real difference to where you sit in Google search. Google likes to rank sites that show they are an authority on a specific topic. Besides most of the stuff I’ve mentioned above, authoritative websites tend to publish over and over again about similar topics. This is the reason that some of your “common” topics rank, and when you delve into new subjects those new articles don’t take off. Let’s say you typically write about WordPress and most of your articles rank well for WordPress-related topics, but you’ve written an excellent piece of content around Ghost (the CMS), but it’s not getting any traction in organic search and seems to be stuck. To boost this page up a few positions, write at least five more different posts about the new subject that you want to ranked. Then – and this is important – link internally (and contextually) from those topically relevant posts to the original piece of content you want to rank. Use anchor texts that include the keyphrases you want to rank for. Penguin 4.0, released circa September 2016, has taken a real disliking to over-optimized anchor texts. Simply put, if your anchor texts are all linking to your page using the keyphrase you want to rank for, your anchor texts are over-optimized, and your page is bound to be hit by a Penguin algorithmic penalty. And once a penalty hits, it will put a strangling hold on your site that won’t let go until your anchor text link profile starts to look natural. And that last sentence there is the key to a great anchor text profile – it has to be – or at least appear – natural. You get the idea. You need to vary the anchor texts as much as possible. If you really, really, really want to get a perfect link profile, there is also one spot-on tactic you can use: analyze the anchor text profile of the sites that are already ranking for those keywords. This is Google showing you its cards, so do mimic that anchor text profile with your backlinks. Sometimes, over the course of time, websites undergo technical changes that might cause all sorts of issues that prevent search engines from correctly crawling them. Duplicate content, crawling errors, duplicate title tags, website speed, redirects, thin content, URL structure, HTTPS, blocked content… are all things that can seriously affect your search engine rankings. Going into detail about each of these is a whole other article, so we’re going to skip that here, but a technical SEO audit is something that should be scheduled if your rankings have hit a brick wall. Writing great content is only half the job of writing content. The other half is writing great headlines that entice the searching visitor to click through to your content. In fact, the click-through rate to a piece of content is one of the most important ranking factors – which you can influence and fully exploit in your favor. If your content, thanks to its headline, is getting clicked to more often than content ranking above it, Google will boost that content’s search engine rankings, especially if your headline is not click-bait but is actually relevant to the content of the article. There are several tactics when it comes to writing headlines, including using shock and/or positive or negative emotion, using magnet keywords (best, ultimate, what is, how to, quick), using numbers (10 techniques to… ), and using an active, enabling voice. Hint: Use a tool that can help you write better headlines such as CoSchedule Headline Analyzer. A small trick you can use in your meta description is to make a partial statement that you leave unanswered, which makes the user curious enough to click through to your content. Yes, the ellipses are intentional to make the user curious. This is one I never get tired of writing about. Writing great content, hitting the publish button and hoping for rankings is a very poor ranking strategy. While Google will eventually crawl your content and just might give it some ranking love, you need to do all of the hard work of getting the content in front of as many eyeballs as possible. Remember that the more users that see your content, the more likely you’ll get positive ranking signals, which I discussed above. In reality, the hard work starts after you’ve written the content. It’s much harder to promote content than it is to write it, but promote it you must, otherwise it’s dead in the water. This is the most important piece of advice: you need to write awesome content targeted at the end user. I started this article around this idea, and I’m going to end it with the primary focus of your rankings – your visitor. Your user’s experience comes first and foremost – if your users are happy with your content, Google will figure that out. You only need to optimize slightly for search engines using the tactics above, but your first and primary focus should always be your users and how to give them the best possible experience on your website. Simply put, once a user clicks through to your page, they should leave that page satisfied. If you user is happy with your content, you’re already well on the way to achieving great rankings.